The hike through the enchanted forest is almost as enjoyable as this gorgeous little lake. The trail immediately enters a forest of immense pines. 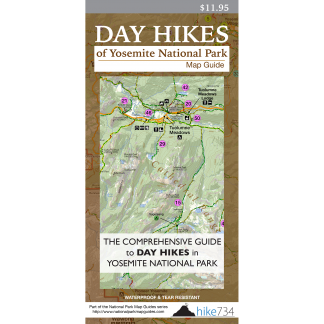 After an easy grade up, the trail gently descends to a large meadow that fills with a vast array of flowers. The trail parallels the meadow, then runs alongside the lake through the trees before crossing the outlet to a shoreline. This is a perfect spot for a snack before heading back. You can also access the lake from the White Wolf Campground. 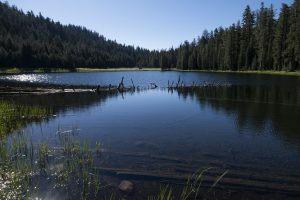 This longer 4.5mi/7.2km round-trip route is mostly level and travels through a beautiful forest with a few meadows before climbing 100ft/30m to the lake. Trailhead: Look for the small, signed parking lot for Lukens Lake along the Tioga Road near Tenaya Lake. If hiking from White Wolf, the trail begins across from the lodge.